When the Rude Boys and Gerald Levert sang, “Don’t you know it’s written all over your face – you don’t have to say a word,” it’s unlikely they were talking about CEOs and turnovers. But it turns out they might as well have been. James Cicon, a finance professor from the University of Central Missouri, has shown in his research that emotions detected on the faces of CEOs could be used to foretell the immediate fortunes of the companies they lead – his peer-reviewed paper discussing the findings has been selected to be published in the Journal of Behavioral Finance. Cicon based his research on the work of Dr. Paul Ekman, a psychologist who put together a catalogue of thousands of micro-expressions and the various emotions that each of them convey. Since this database of facial expressions and corresponding emotions was already available, Cicon needed to find a way to cross-reference the information with the facial expressions of high-level executives at important junctures in the lifecycle of their companies. In order to do this, he teamed up with his colleagues to build software that parsed footage of CEOs – including CEOs of well-known companies like CitiGroup and FedEx – obtained from interviews and videos of earnings calls. He then analyzed the footage and isolated the expressions on CEOs’ faces to suss out what they were really feeling while promising growth and a brighter future. The software has thrown up some surprising results about what CEOs’ visible sentiments portend for companies. Interestingly, negative emotions like anger, disgust, and fear were shown to correlate with positive trends in the financial performance of organizations; CEOs whose faces portrayed disgust during interviews were able to achieve a 9.3 percent increase in earnings; CEOs whom the software deemed as emoting fear also managed to raise the value of stock in the following week, although by a more marginal 0.4 percent. Though his software could give us a peek behind the company curtains in an unconventional manner, Dr. Cicon has his own misgivings about its accuracy. He claims the emotion-recognition feature is correct 90 percent of the time, though that number remains to be verified by an independent source. More accurate emotion-sensing software may come to us from other sources, though. 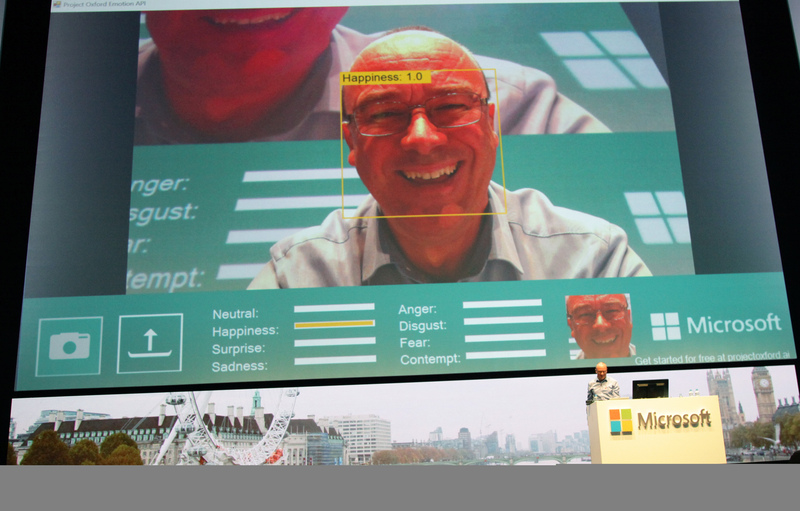 Late last year Microsoft revealed that its Project Oxford team had been actively working on its own software to read emotions, albeit for more commercial purposes. A paper by the Microsoft research team published in the Institute of Electrical and Electronics Engineers journal gives us some insight into how their software is able to tell how people are feeling. Microsoft’s technology uses video clips and static images extracted from movies to train its deep learning technology to recognize emotions. Since they have the whole neural network thing going on with it, the software will get smarter over time and eventually improve at detecting more nuanced sentiments. With the emotions of leaders shown to be an important indicator of performance and emotion-recognition technology already being an area populated by big players, it may not be long before analysts, journalists and of course investors, are using this kind of software for all kinds of inferences and guidance. CEOs had better be working on that poker face – dissembling with words may not work for much longer. Very cool technology involved here. I like to see the technology used for things like this, but then it also freaks me out to know what it COULD be used for. There is already a thousand ways that you can read the market. Toss this one in there and watch the “experts” sell their best services based on someone’s face! Can you imagine how this is going to be in the news over the next few months? people will be trying to speculate on the future of business and as soon as a CEO reads this, he will be making “fake” faces to see what happens! LOL. I would really hate to see how the CEO looks when he is behind closed doors. We all know they can tell a good sob story with a smile and nobody even realized the stock is about to tank. Oh boy! I think I just heard the stock market crash and burn as I was reading this. Now instead of stocks going down because someone bashed the company on CNN, it will just crash the next time Bezos looks like he is going to fart!